Annual NE Neighborhood St. Paddy's Day Parade starting at Beverly Cleary School/Fernwood Campus. 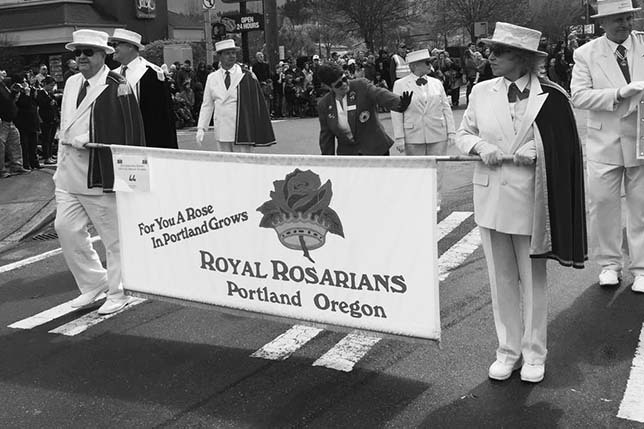 The St. Johns Parade has been a tradition in the North Portland area since 1962. People from near and far look forward to this event every year. Many families have their favorite viewing spot and many who have moved away come home for this special week-end to watch the floats, bands, drill teams, and horses. Parade participants from the early years are now watching their children and grandchildren as they march or ride the parade route. The parade kicks off every year on the 2nd Saturday in May - promptly at noon. The Tillamook County June Dairy Parade, considered to be the third largest parade in Oregon, debuted in 1957. It is held the fourth Saturday in June. A rose planting ceremony is conducted at 10:00 am at the Tillamook County Pioneer Museum. The parade begins at 11:00 am, starting at Goodspeed Park, down Third Street before turning on to Main Avenue. The Good in the Hood Festival is known as the largest multi-cultural festival in the Pacific Northwest. The Festival is a Rose Festival sanctioned event. The parade starts at 10:00 am and begins at the King Elementary School and on to the Tubman Middle School. Following the parade is a “virtual” rose planting ceremony. The parade is sponsored by the Hillsboro Rotary Club and features about 135 entries, ranging from marching bands to fire trucks, and of course, plenty of candy for the kids. The parade gets underway at 10:00 am. The biggest and oldest Grand Land Parade west of the rockies. At 9:00am Royal Rosarian Rose Planting at the Lighthouse Park in Warrenton. Parade through downtown Astoria starts at 12:00pm. Portland’s only Veterans Day parade started in 1974. Vernon E. Ross, proprietor of Ross Hollywood Funeral Chapel, founded this parade to honor all veterans, past and present, living and deceased. The Parade starts at 9:45 am at 40th and Sandy Boulevard and travels down Sandy, ending at Sandy & 48th in front of Ross Hollywood Chapel, which is the site of the Veterans Memorial Flag pole. At the conclusion of the Parade there is a Flag raising ceremony along with comments from dignitaries, music from local High School bands, Dove release and a military flyover from the Oregon Air National Guard 142nd Fighter Wing.